« Dairy Goddess : Yep, Cool Cows Are Our Priority And Water Is My Worry! Great Work, keep us iformed with updates, this information is very important to our health. Thanks Rose, I think it is important to share information, especially in a time where there is so much MIS-information. This post just made my whole year!! I love whole milk, and I have always believed that it was absolutely terrible for me and that I should only drink skim milk – which obviously doesn’t taste as good. I definitely will be changing whole milk back into my diet after reading this and I will also be informing all my friends who love whole milk – and those who don’t!! So glad to hear that Tiffany…WHOLE, Natural, the way it is suppose to be! Cheers! Wow, as a dairy girl, I feel embarrassed! I had no idea that the vitamins in milk could not be digested without the fat – I just hadn’t considered that before! Of course, I realize the importance of milk’s nutrients and the numerous health benefits it provides, but I thought that the fat in whole milk was most important for young children or athletes seeking those extra calories. THANK YOU for expanding my dairy knowledge!! Great post. I have just started a diet that also encourages eating full-fat dairy for many of the same reasons you list here. I recently switched to Organic, Non Homogenized 2% milk. I was debating if I should go whole milk because i thought i will get fat but from your article it looks like it helps with with absorption. I will grab a whole milk bottle this week and will give it a shot. BTW, switching from homogenized to non-homogenized made a difference. Its easy on digestion. My friends are saying its psychological and placebo effect but I know I am feeling the difference for real. Hi Faisal, Thanks for your comment. I am so happy that you are becoming a believer! Whole Milk, is exactly that! Whole, Natural, Less processed…with all of the natural goodness and healthfulness for why we drink milk in the first place. Besides it tastes so much better! Non-Homogenized DOES make a difference…think about it. It doesn’t come out of the cow homogenized. It is just a “cosmetic” process so you don’t have to shake it. This process damages all the natural enzymes that disturbs digestion because it is NOT the way it was created in the first place. Less processing in all foods is best! Cheers…with a glass of Whole Milk, of course! How long is non-homogenized creamline milk typically good for? 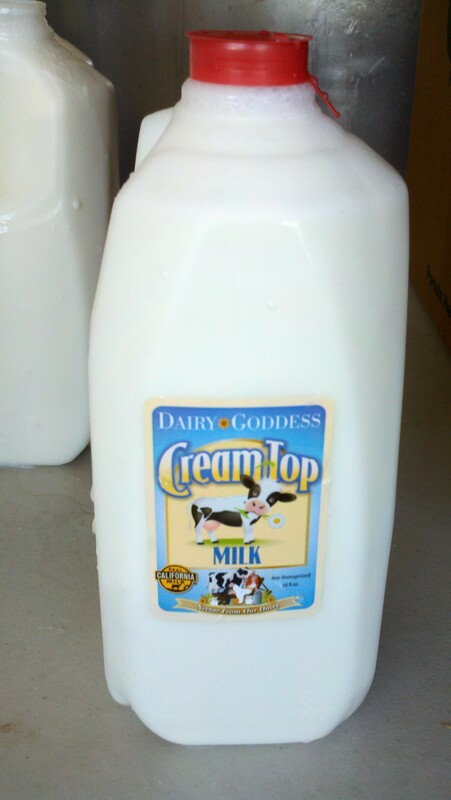 I recently purchased some at a local Amish dairy farm. Fabulous! But I’m not sure I know how long it will stay in my refrigerator. Hi Emily, Thanks for your question. Your milk should last up to 18 days from the day bottled. Of course that is keeping it cold at all times. Don’t for get even when the milk does sour it is still good to use. Make pancakes with it.